I have a 2016 230 Suncoast and want a secure flag mount. My boat has the folding arch tower. I would prefer a good looking after market product to reduce costs. Does anyone have any suggestions of where to look for such a product or where to secure it on the boat? 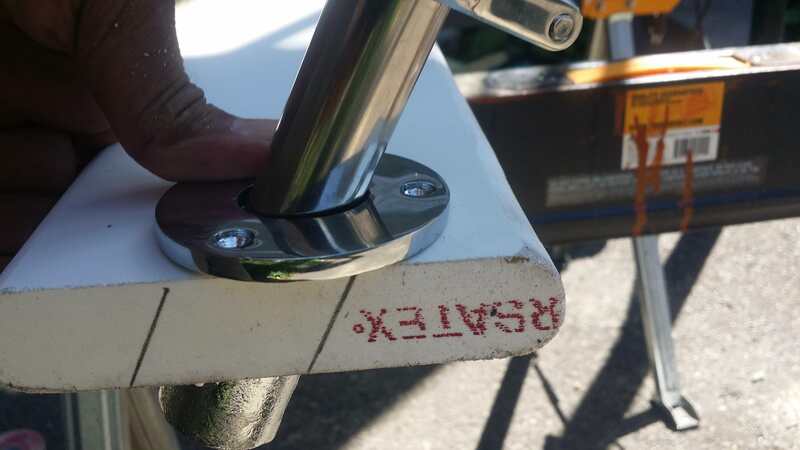 First is use one of these surface-mounted holders and just place on top of the gunwhale (a little aft of the rear of the arch tower) and just drill 3, small holes (3/16") for the screws and you can mount the flag pole into it and tighten that screw handle. 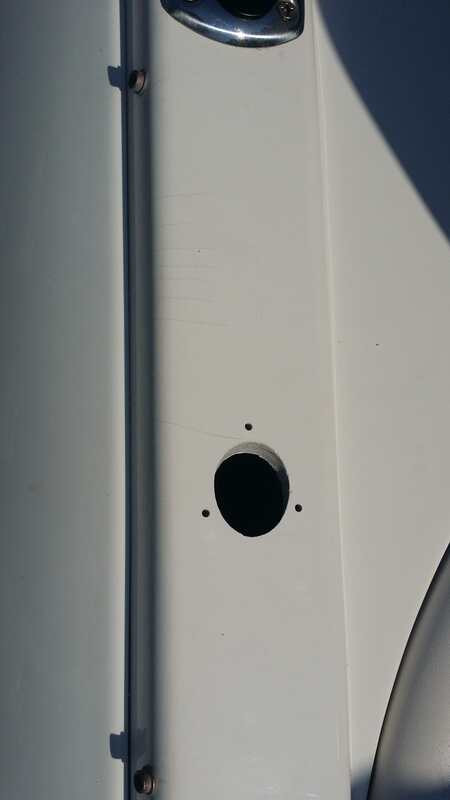 Careful when you drill the holes into the gelcoat & fiberglass, there's a special trick to reduce checking and cracking from the screw threads expanding into the fiberglass. Or you could use one of these recessed mounts which means a bigger hole (1-3/8" I believe) and then drill the 3 additional screw holes and the flagpole is recessed into that base which makes for a much flusher look. Or you can get the type that clamps on a rail and see if you can connect it to the tower since it's tubular, if that's where you'd rather place it. Some boats Use the stern light pole as a flag pole. I buy a separate light pole just for a flag. Works for me & others. Many ways to do it. Walk the docks until you see what is the one for you. Owner should fill you in. Google wake tower flag holder, there are a bunch of stuff that comes up, this was just the first thing. All the bow mount clamp on flag holders Ive tried blow down at 25-30 mph. Bow flags should be more robust The OLD MASSIVE chrome plated combination bow running light AND flagpole holder are best. Most had a locking means with out clunky knobs or screws. Push down & twist. Spring pin into a hole. Really fast boats do not leave them in at high speeds. The flags shred quickly at 45 to 50 mph. Been there. "Bow" mounted flag poles? 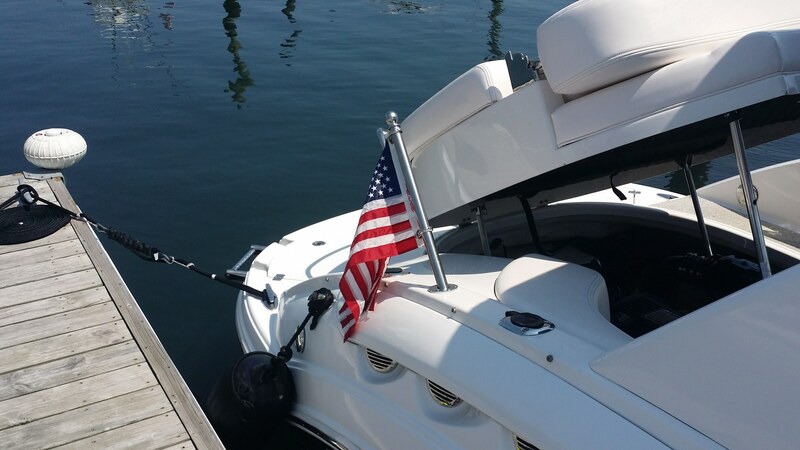 Not sure I've ever seen a flag mounted on the bow of any of our types of boats TBH. Almost always they're mounted somewhere on the stern end of a fiberglass boat in our class of boats. A buddy of mine is restoring an old Chris Craft mahogany runabout and is putting 2 flags on it, one at stern and one on the center of the bow top. More common on woodies like that but not sure that location works on a bowrider. It would certainly look unique. 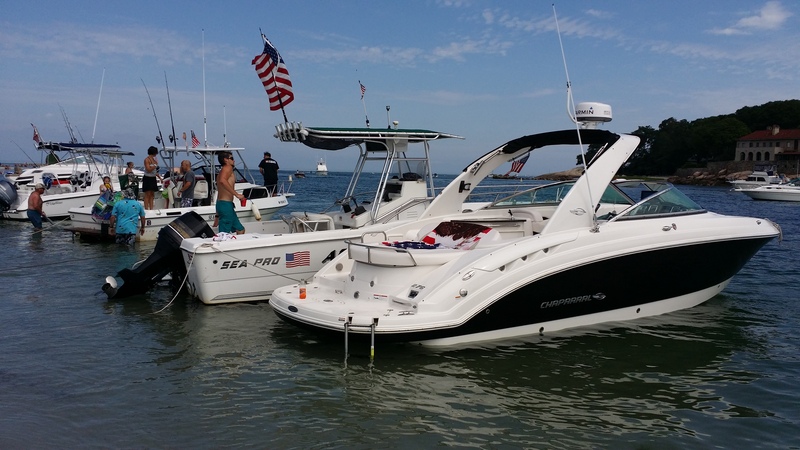 Bigger boats with bow rail sometimes have bow rail mounted flag poles. A cuddy cabin is perfect for a bow mounted flag holder. 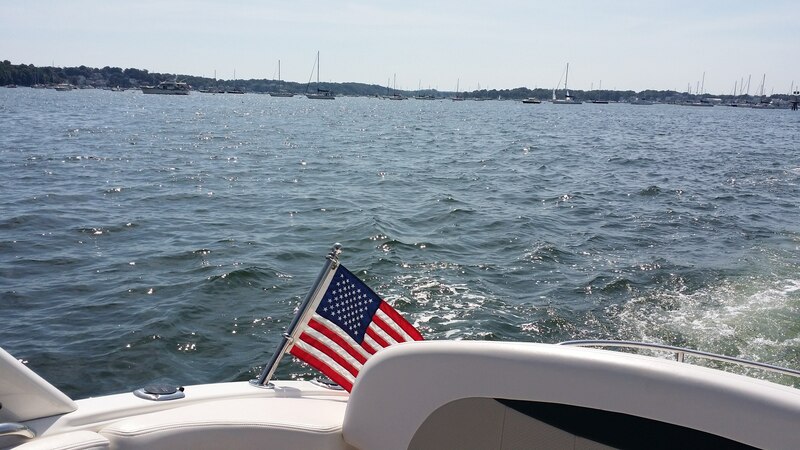 The flag up front is typically a manufacturer, yacht club or any other flag desired. You can stack 2 or more flags if you desire. It can be anywhere on the bow surfaces. The centerline is not mandatory. Sure. 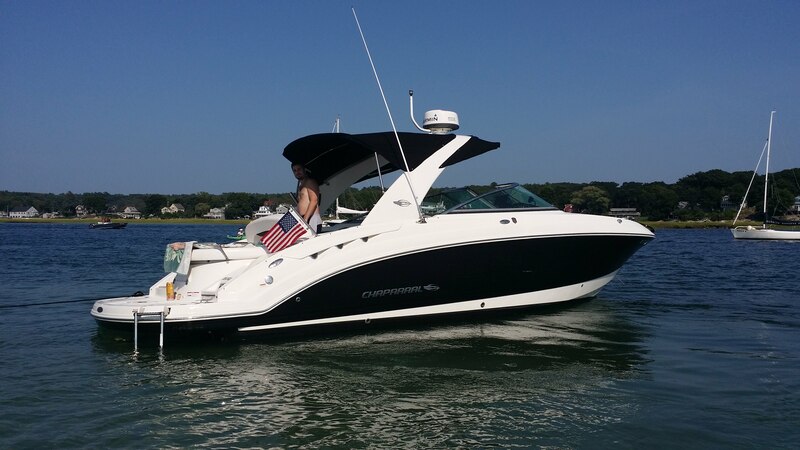 I just don't think on our bowriders -- or even cruisers like yours in the 35'+/- range that a bow rail flag is a good -- or even common -- location for it. When I first installed mine this past summer, I was a bit iffy about the location and angle of the pole, but it quickly grew on me and now I actually like it a lot. I might try a straight fitting so the angle is a bit less steep and just perpendicular to the curved gunwale itself. These little details are important, you know. I'd like to even add a second one on top of the arch right behind the nav light. That would be pretty cool. Fly the old star spangled banner there and then use a different flag on the stern pole. 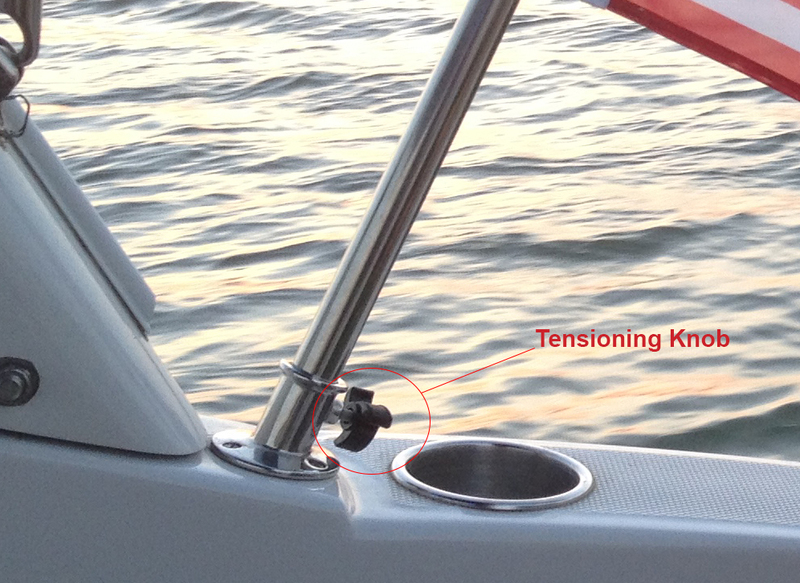 Prior to installing this one, I used to just hang the flag off the bimini support poles. Worked fine for the time being but it needed a permanent spot. 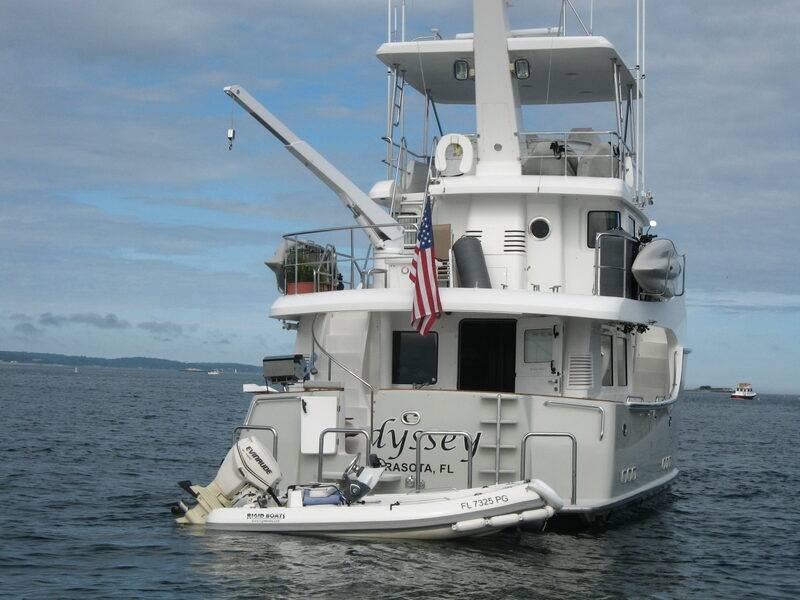 My buddy has a huuuuuugggeeaah one on his Sea Pro CC T-top bimini. Look at the size of that thing! lol. Even a gorgeous 60ft Nordhaven has its flag mounted astern. Perfect location for a big flag. Not sure what that toilet seat is, though. Love the kayak mounts on this thing. With every type of boat will give you different places to mount it. You need a spot thats it right for you. Not in your way, not blocking you view and how big is your flag. 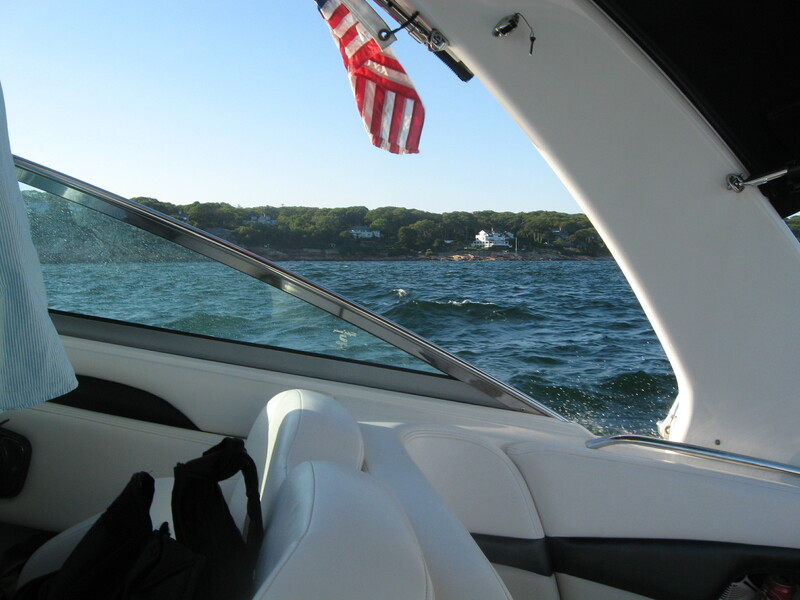 I fly our clubs burgee on my bow rail, which is not uncommon to do. In the above, the walk arounds (Sea Pro) have a great place using there rod holders. http://www.usps.org/f_stuff/etiquett.html From the U.S. Power Squadron. Thanks everyone for the feedback and ideas. There was / are VERY TALL stern light poles. I use 1 as a flag pole. What do you mean by "I made a flag pole using a small piece of aluminum tubing and a nice wooden flag pole" ? You put the aluminum tubing through the center of the wooden flag pole to strengthen it? Did you turn the wooden flagpole yourself? Really, how can you say that?? Its possible given his description. lol. When I first read this, I thought to myself there has to something wrong here. There's no way this guy could be serious and then it dawned on me!!!! You have no clue what "Pics or it didn't happen" with a smiley face at the end means, do you?! It means "show us a pic so we can actually see it because we'd like to see it" done in a friendly ball busting sort of way. No one is arguing with the lad about what he did, relax. Ahahahaaaaaaaaa! Now I know you're a lot more delusional than I originally thought. I guess it did! Thx for posting that. Is the seasucker functional too? Or you just used it for the flagpole base? Hmm....I have one that's withstood 30mph+ and an ocean crossing. Never blew down. Our boat came with the surface mount as pictured below. I like Hatem's flush mount much better, though. Chaparral has used this optional flag pole for a few years with no issues. 1" heavy walled stainless steel pole. No need to modify or reinforce your cockpit cover. and I am delusional ??? I believed Vonshep, you did not! You said " Pics, or it didn't happen." Which means you were calling him a ............... Really!! Smiley face or not.